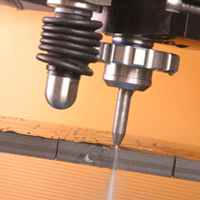 DallasWaterjet provides 5 Axis waterjet cutting, brake forming, weld and spot-welding and finishing of many traditional and non-traditional fabrication materials. DallasWaterjet can provide cut-to-print and build-to-print services using your design drawings. Or if you are the type of guy that only has a napkin with a sketch, we can produce fully detailed and engineered design drawings using our in-house design capabilities submitted for your approval prior to fabrication. With Waterjet cutting technology, DallasWaterjet can cut sheet gauge stainless steel up to more than 6” thick with no heat effected zone. Waterjet versatility makes it possible to cost-effectively cut many materials not possible with traditional cutting technologies.